I just had to share this Instagram post from Camerata (above), one of my favorite wine bars in the U.S. (which just happens to be in the city where I live, Houston). David is referring to a Franciacorta Real Story tasting I did there earlier this year when we tasted an impressive flight of Franciacorta, including the wine he’s just added. Slowly but surely, interest in Franciacorta is growing across the U.S., including Houston, a thriving and bustling however emerging wine market. One of the things that struck me about the post and the fact that they’ve added this Franciacorta is that the wine wasn’t available in Texas until David brought it here. Restrictive wine importing and distribution regulation here can pose extreme challenges to wine buyers who look beyond the major wholesale wine channels. But not for buyers like David, who increasingly look to the smaller Texas distributors for help in bringing beloved and coveted labels here. As far as I know, the Franciacorta in question is available only in New York (where I drank it by-the-glass at Eataly on Thursday of last week). And now in Houston. This brings to three the number of Franciacorta wineries that have become available for the first time here this year. It may seem like a trickle but it’s actually a stream. And our wine world is a better place for it. Check out this interview with David posted by Alder Yarrow on Levi Dalton’s “I’ll Drink to That” podcast. 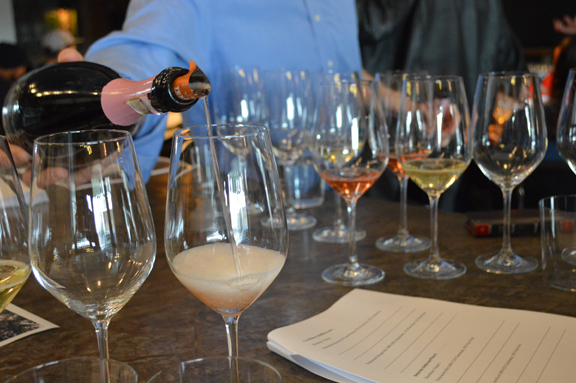 Previous post ← Is Franciacorta’s time finally arriving?